Associated Bank colleagues in Madison have a long history of supporting efforts to prevent homelessness and end hunger in the community, through charitable giving and volunteerism. 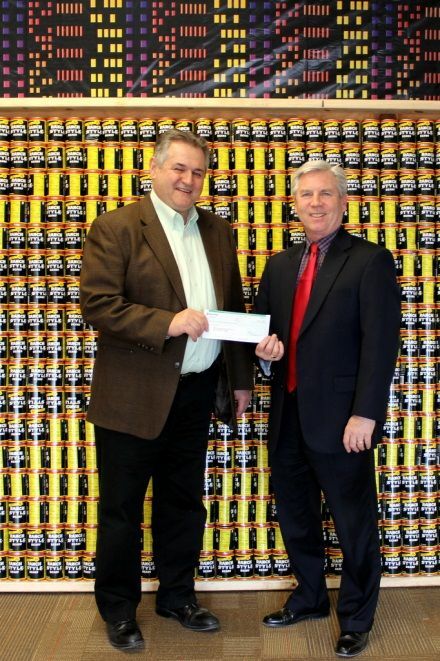 The Regional Leadership Team in Madison recently donated $2,500 to the Middleton Outreach Ministry (MOM) — and served as a Platinum Sponsor for Canstruction®, a community competition to end hunger where teams build highly imaginative structures out of canned goods and packaged food they’ve purchased or collected. After the event, the food is donated to MOM’s Food Pantry. “We support MOM because it serves a lot of individuals who are trying to get back on their feet, who are maybe in transitional or low- to moderate-income housing,” said Steve Hansen, senior residential sales manager. In addition to this charitable contribution, Madison colleagues have spent time volunteering at MOM, which includes their help at Days of Caring – reorganizing inventory, cleaning the warehouse, and getting orders ready. “It’s a great way to give back to our community in service, and our contributions benefit many families, including LMI families, which assists the bank with our Community Reinvestment Act initiatives,” Hansen said.